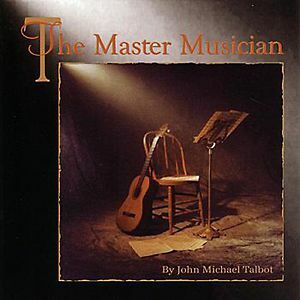 The Master Musician: A musical journey and parable depicting God as the Master Musician and we as his instruments. As God the Master Musician crafts us into fine musical instruments, we can "join in the symphony orchestra of the church and make a beautiful music bigger than any one musician for all the people of the world." 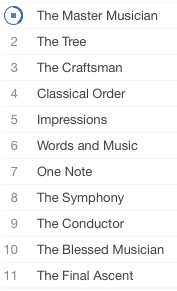 This album includes 11 beautifully orchestrated and inspiring songs: The Master Musician, The Tree, The Craftsman, Classical Order, Impressions, Words and Music, One Note, The Symphoney, The Conductor, The Blessed Musician and The Final Ascent. The companion book, "The Master Musician", is now available in paperback from InterVersity Press. Click here to order book.